Authors, journalists and programme-makers have been visiting an anonymous suburban house in Golders Green, north London, for nearly forty years. What has drawn them there is the Hans Tasiemka Archive, a privately owned collection of more than six million magazine and newspaper cuttings – including from The Oldie – dating from the 19th century to the present day. Since 1979, this jewel of journalism has been run by Edda Tasiemka, Hans’s remarkable widow, now 95. During a recent research trip, I was told that Mrs Tasiemka had finally resolved to lay down her scissors and part with her extraordinary library. It is a big decision. An institution is coming to an end. Mercifully, the treasure trove is not going to be incinerated or recycled, but has instead been given free of charge as a going concern to another archivist, James Hyman, on condition he keeps it intact. He has exciting plans for its expansion (of which more later). First-time visitors to Tasiemka’s 1920s semi-detached are always stunned. 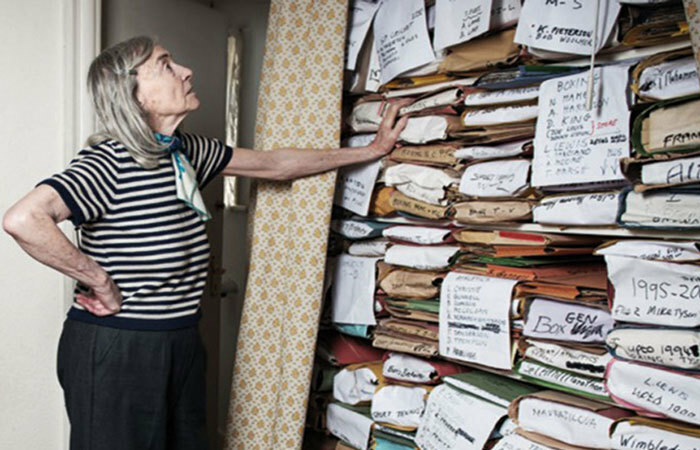 Every room on its three floors – including loos and the kitchen – contains what appear to be haphazardly stacked folders, the results of her and her late husband’s meticulous filing. Floor space, corridors, cupboards, shelves and the garage have long since been filled. The house is bulging with information. ‘The loft is full of dead people,’ Tasiemka twinkles, meaning cuttings of deceased subjects. The many thousands of topics categorised range from the conventional – Margaret Thatcher or the Kray twins – to the eccentrically specific (‘Runaway mothers-in-law’). Almost nothing is off-limits. Religion is in her bedroom; sport in a loo. Crime is her favourite. Having developed her own index system, the sprightly Tasiemka has always been able to locate the best cuttings swiftly, often making helpful suggestions to researchers through years of carefully acquired knowledge. Historian Robert Lacey once said of her, ‘Mrs Tasiemka was a Google search engine long before Google was invented.’ Who can argue with him? She is tall, stands ramrod straight and greets me with a firm handshake and a big smile as I enter her sitting room. She offers me ‘vino’ while she lunches on a sandwich made by her assistant, Heidi, who has worked with her since 1976. Tasiemka was born in Hamburg in 1922, the adoring daughter of a socialist politician who fled Germany for Russia when the Nazis came to power. She was raised partly in Moscow and then, back in 1930s Hamburg, solely by her mother. She became involved in the cuttings business after meeting her husband, a journalist, in war-torn Germany. They married in London in 1949. While she worked as the London correspondent for various German magazines and radio stations, and Hans did some journalism, he built up the archive from their Finchley bedsit. It grew further when the couple moved, in the early 1960s, to their present house. On Hans’s death in 1979, Tasiemka named the archive after him and in effect commercialised it. ‘The 1980s and 1990s were a high point for us,’ says Heidi. ‘I cut like a nutter,’ agrees Tasiemka, laughing. Then came computerisation. She has never used the internet, but believes it slowly killed her business. In terms of cuttings dating back to the 1990s – many of which can be found online – she may be partly right. But finding anything earlier online is unlikely – giving her archive continued relevance. Anyway, hard copies retain their value. Not every newspaper story is available to view online. I quote her a recent example of a national newspaper editor who acquiesced when a Labour MP complained on spurious grounds about a perfectly legitimate article on him. Shamefully, the piece was removed from the paper’s website and now only exists in hard copy. Many magazine articles are not available online at all. The Hans Tasiemka Archive stands alone in its phenomenal range and accessibility, given the relatively low fee one is charged to view it. New owner Hyman began the mammoth task of moving it to his premises in April. He will scan every article, using specialist technology to make it the written and photographic equivalent of music-streaming service Spotify. He will also keep every hard-copy cutting at his London office and carry on cutting. But her emotional attachment to it must be enormous. And she is clearly pleased to have found a new keeper in Hyman – as she should be. The Hans Tasiemka Archive is one of the most important sources of the past 150 years of general interest journalism in the world. And its future is secure.